The fibre space Bag in Paris | Knit Like You Mean It. The bag’s journey begins at Paddington Station. Those of you who know me well know I can take a good thing too far. Well, blame Danielle — she asked us all for photos of the fibre space bag around the world, and I’m doing my part. 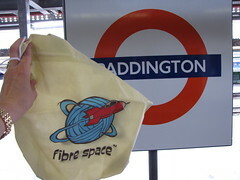 This weekend, the fibre space bag took the Eurostar train through the Chunnel with me to Paris. It’s seen the Eiffel Tower before, so spent most of its time searching for knitters in Paris. Follow its travels in my “fibre space Bag Grand Tour” Flickr set. If all goes well, next stop for the bag will be a trip to London or Stratford-Upon-Avon. Send yarn shop recommendations! Nice photos. I am so jealous of the bag’s journey!